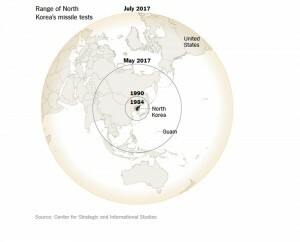 Home > News > This Missile Could Reach California. But Can North Korea Use It With a Nuclear Weapon? 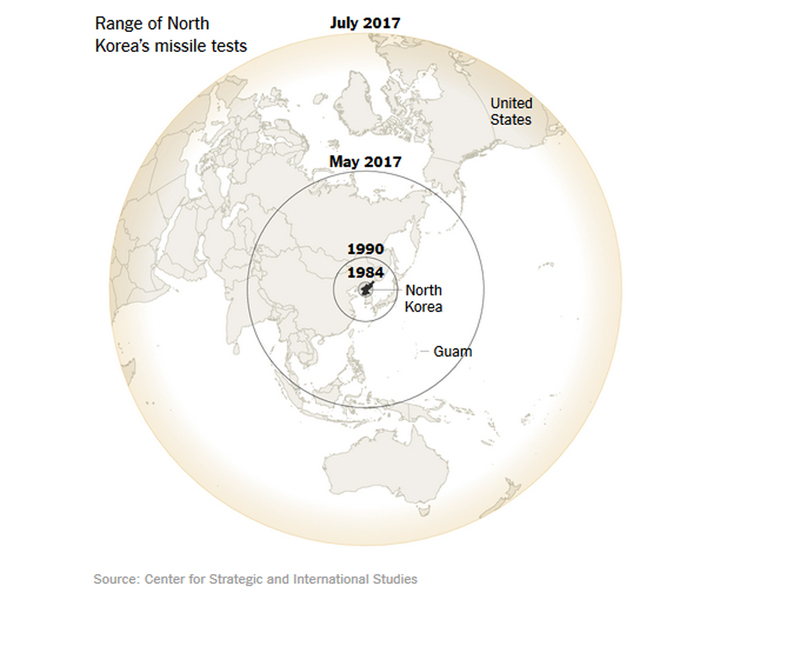 North Korea is speeding toward a goal it has sought for decades: the ability to hit a major American city with a nuclear weapon. Actually striking the United States would be suicide. But the capability could help the North deter an invasion and wield increased global influence. American intelligence agencies estimate that the North could reach the milestone by next year, and some experts think it already has. But reliably sending a nuclear warhead halfway around the globe is extremely difficult, and challenges may remain. Here are some of the systems the North needs to advance or master. Here’s what the North’s intercontinental ballistic missile looks like, at least as experts can best determine. It’s the first ICBM to have flown successfully after many years of empty claims and abandoned models. North Korea tested it twice in July. The second test appeared capable of reaching the West Coast, with Chicago and Denver also potentially in range. The North’s ICBM program was long known for modest strides and spectacular failures until it made a rush of advances this year. Analysts say a powerful new main engine lies behind the feats, calling it stronger and more reliable than past models. A crude version by next year, if not already. It’s relatively easy to get a vehicle into space but very difficult to bring it down. The main problem for North Korea is developing a missile warhead that can withstand the fiery heat and great violence of atmospheric reentry. The forces at work are enormous. A warhead fired into the void of outer space by an intercontinental ballistic missile falls back to Earth at speeds of roughly four miles a second. Intense friction with the planet’s thick blanket of air produces waves of blistering heat. A badly engineered warhead will burn up long before hitting its target. One trick of designers is to coat the reentry vehicle with thick materials that burn off evenly, making an ablative shield that sends dangerous heat into the wake. But manufacturing errors can produce uneven burns that throw a warhead off course. Last month, a camera in Japan caught a glimpse of a North Korean mock warhead as it reentered the atmosphere at night. At first it looked like a shooting star, but then it seemed to shed a trail of bright sparks and shimmers before dimming and disappearing. Some experts see this video as evidence that the reentry vehicle broke into pieces. What’s clear is that the North is trying hard and making progress. Military and intelligence experts tend to assume the worst – arguably a prudent approach with weapons of mass destruction. 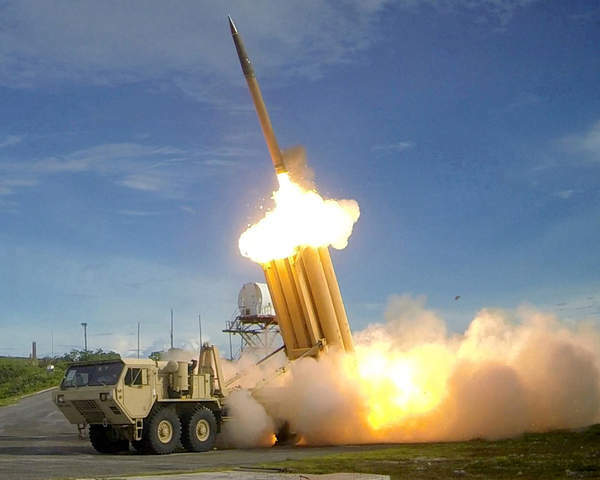 If the North keeps up its rate of missile tests, it will likely have perfected a crude re-entry vehicle by next year, if it doesn’t possess one already, private analysts say. Much of the technical debate over the North Korean threat has turned on whether it has miniaturized its nuclear arms so they can fit inside the cramped space of the missile nose cone. 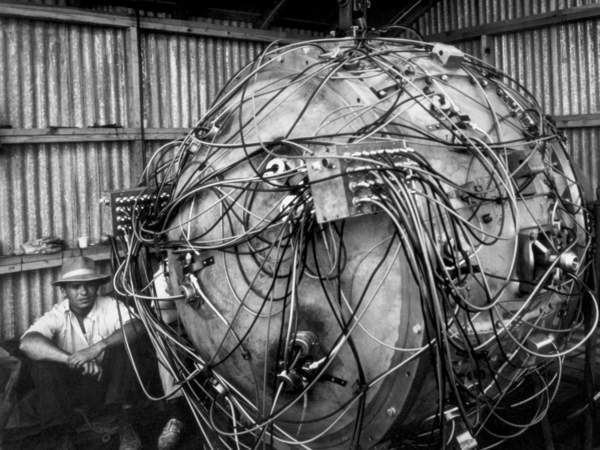 The first atom bomb – dubbed the Gadget – was five feet wide. 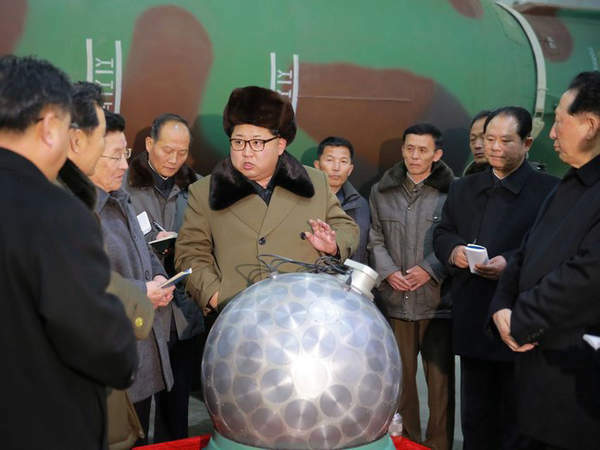 Last year, the North released a photo of its leader, Kim Jong-un, inspecting a shiny ball described as a miniaturized bomb meant to fit into a missile warhead. It was about two feet wide, small enough to do the trick. New Mexico, 1945. | Photo by the United States Department of Energy. It’s impossible to know whether the photo shows a working weapon or a mock-up. But nuclear experts, including American intelligence agencies, judge that the North has indeed succeeded in making its nuclear arms small enough to fit atop an ICBM. The smaller and lighter the bomb, the farther it can go. 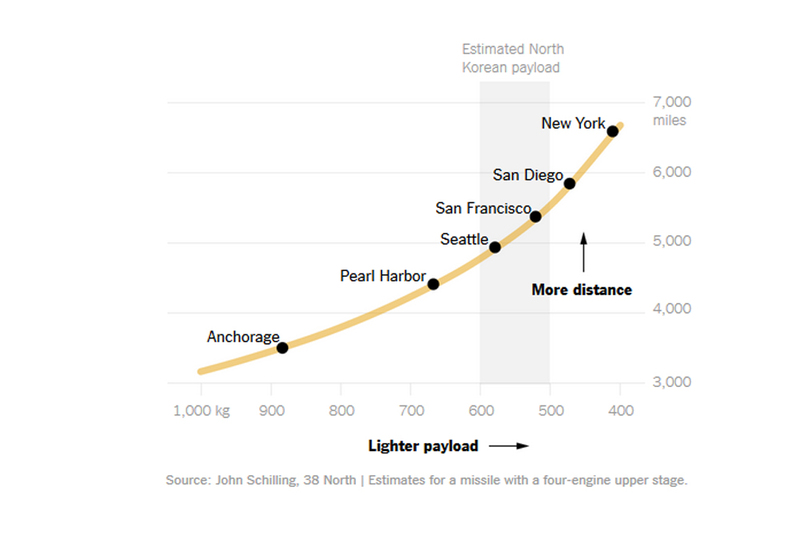 The chart below estimates how the range of North Korea’s Hwasong-14 missile increases dramatically as the weight of the warhead decreases. North Korea’s aim is famously poor, and accurately directing a long-range missile that throws warheads halfway around the world is extraordinarily challenging. 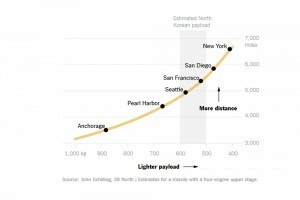 One estimate for North Korea, based on the accuracy of other first-generation ICBMs, ranges between three and five kilometers, or about two to three miles. The true accuracy is impossible to determine because the North’s warheads usually fall into the sea, and outside experts know little about its intended targets. Even so, “that’s good enough if you’re aiming at a city,” said Ian Williams, a missile defense expert at the Center for Strategic and International Studies. But it would probably be insufficient to reliably take out a hardened target like a military installation, he said. Analysts say North Korea appears to be working toward leaner, more accurate designs for its missile warheads. It currently appears to use a blunt re-entry vehicle that is relatively easy to make but slower and less accurate than the pointy models of advanced states. North Korea can sidestep the accuracy question and do more damage with a more powerful bomb. But that’s difficult given the cramped spaces in a nose cone and the need to keep the weapon as light as possible. Based on nuclear detonations at the North’s underground test site, analysts say the nation currently has weapons with about the same or slightly more destructive power as the Hiroshima bomb, which destroyed the city and killed an estimated 70,000 people with its initial blast. The standard way of raising the destructive power of a bomb, while keeping it relatively small and lightweight, is to add thermonuclear fuel. The steps are technically daunting but can produce weapons with up to 1,000 times the destructive power of the Hiroshima bomb. 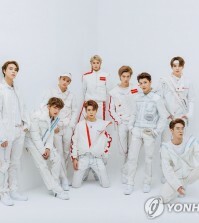 Generically, they are known as hydrogen bombs. 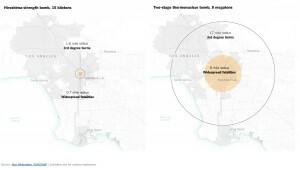 Here’s a rough map of the difference in destruction if a Hiroshima-sized bomb and one 600 times stronger, the size of one of the largest ICBM warheads ever deployed, hit the center of Los Angeles. Source: Alex Wellerstein, NUKEMAP | Estimates are for surface explosions. The North Koreans have shown great interest in making hydrogen bombs, but experts have no clear sense of how far they have traveled down the thermonuclear road. The clearest indication would be a very large underground nuclear blast. So far, the North has detonated nothing that comes even close. Can’t the Americans just shoot down an incoming nuclear warhead with an antiballistic missile? Maybe. But that kind of protection has never been used against an ICBM in war, only in highly choreographed tests. Even then, the costly antimissile systems have often failed to hit the speeding mock targets. It’s a numbers game that can play to the offense. 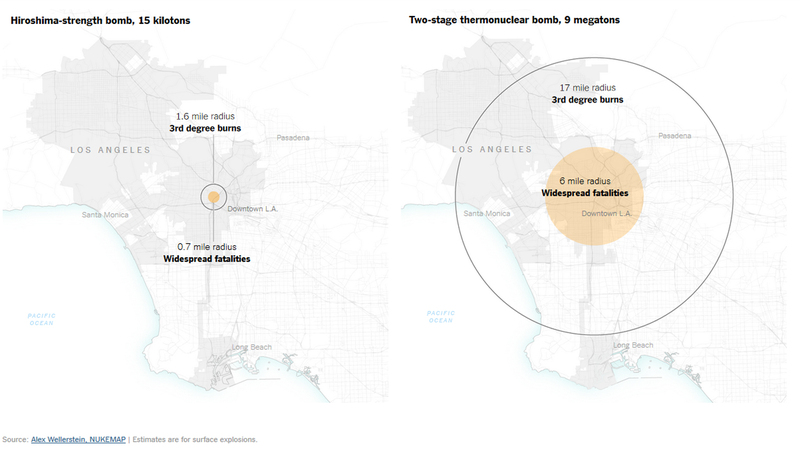 If the North fires three nuclear warheads and the United States manages to shoot down two, the North would still accomplish much of its objective with just one city’s destruction. Warheads that zig and zag could foil antimissile systems. North Korea recently displayed a missile warhead that boasted fins, implying an interest in such evasions. A final step would be clouds of inexpensive decoys. Advanced ICBMs carry large sets of such fakes alongside real warheads. The false targets provide protective cover and vastly increase the complexity of the antimissile effort. How will we know when the North Koreans have truly attained the ability to threaten the United States? A friend recently asked Mr. Williams. “I kind of just shrugged my shoulders and said, well, you’re going to see a bright light,” he said. Many experts say the North Koreans are well on their way, and they expect the first serious deployments next year. Whether the rogue state’s possession of the ultimate weapon will change the world remains to be seen. In the best case, it could be just another in a long series of unthinkable standoffs the world has learned to live with over the course of two atomic centuries.